It was a privilege to photograph Oscar Olivier for Jewish in Seattle late last year. 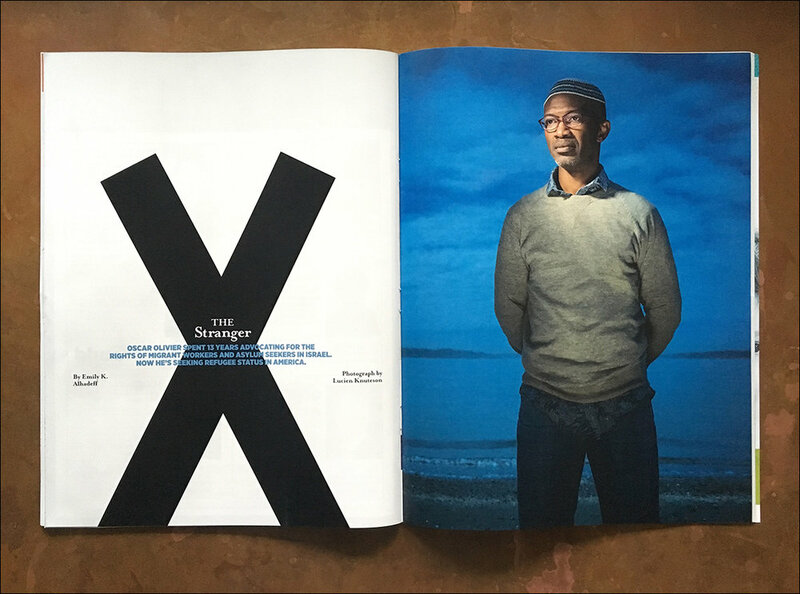 He is a refugee from the Congo and an inspiring figure, and if you have a moment, you should really do his story justice by reading the excellent article by Emily Alhadeff. We made this portrait in Des Moines, where he lives. Neomi, the art director, wanted something that looked dramatic but we didn't have a location and the weather wasn't cooperating. It was a mighty bright, happy day outside (albeit still chilly—note the very stylish cardigan). So we hit the beach—can't go wrong with water and a good sky as your background—and utilizing a little day-for-night camera and lighting trickery, we made it look a bit more moody. I was really pleased with the result. Below is my favorite image, along with Neomi's select as it appeared in the magazine.